／foresheet: n.[海]前檣(ぜんしょう)帆の帆脚綱(ほあしづな)、前檣帆の下隅索、フォアシート; (pl. )[ボートなどの無甲板船の]艇首座、 フォアシート(opp. stern sheets); (～s)[艇首座のある]船首部の空間. ／bush: n.[機]ブッシュ、座金(ざがね)、入れ子 [磨耗などを防ぐために、心棒などの穴にはめこんだ金属などの 内張り(bushing)]; はめ輪、vt.…にはめ輪(入れ子)を取り付ける、金属の内張りをする. zaihou[海底・海中の]財宝: undersea treasures, underwater treasures. ／co-ordinates of latitude and longitude: 経緯度座標. [参考][1982年国連海洋法条約第16条2項] The coastal State shall give due publicity to such charts or lists of geographical co-ordinates and shall deposit a copy of each such chart or list with the Secretary- General of the United Nations. : 沿岸国は、[１項にいう]海図または地理学的経緯度の表を適当に公表するものとし、 当該海図または表の写しを国連事務総長に寄託する. ／plank-sheer: n.[造船][木造船(a wooden ship)の]船鍔(ふなつば)材　[参照]鍔(つば、ガク). ／general cargo: n.雑貨; 一般貨物、一般積取り貨物 [傭船契約による貨物(full cargo)に対していう、個々の荷主から 引き受ける一般の船荷][略: G/C]. ／[文例]They have long considered tilapia a trash fish. : テラピアを雑魚(がらくた、屑の魚)と長く見なしてきた. ／stationary air: n.[医・生理][機能的]残気 [通常呼吸で肺に残っている空気; 呼気後肺の中に残る空気]. zanryuu残留:→ residual: adj. [排出後なおも器官に]残留している; 残留性野; 残余の. ／fish residues; residues originated from fish processing: 水産廃棄物. zanson残存(ざんそん): → relict: [生態]残存生物、遺存(残存)種 [環境の変化で限られた地域に取り残こされた生物[種]]. zarabikunin[魚]ザラビクニン: rough snailfish, [学名]Careproctus trachysoma[クサウオ科：オホーツク海、日本海などに 生息する]. ／Japanese crayfish, Japanese crawfish: n.[動]ザリガニ. ／cockle: n.[貝]ザルガイ [トリガイ(鳥貝)など]、[特に] ヨーロッパザルガイ[食用二枚貝]、トリガイの類 (→　Cardiumなど); ザルガイの殻(cockleshell); [底の浅い]小船(cockleboat). ／cockleshell: n.ザルガイの殻; それに似た貝の殻 [ホタルガイなどの殻]; 鳥貝(cockle)の殻;　[海]底の浅い軽舟 (＝cockboat). aground: adv., predicative adj. [形容詞としては叙述用法]浅瀬に; [船が]陸(岸・浅瀬・砂洲・暗礁などに)に乗り 上げて(揚げて)[いる]、座礁(坐礁・擱坐)して(stranded)[いる]、地上に. ／to go(run, strike) aground: [船が]浅瀬に乗り上げる(揚げる)、座礁する[on …]. ／A, P flag: n.[国際信号旗の] A、Pの２旗信号 [｢我擱坐しあり｣を示す]. ・　[浅瀬に]乗り揚げている: to be aground. ／grounding: n.[海]座礁(ざしょう)、坐礁(ざしょう)、擱坐(かくざ)、乗揚げ、乗り上げ [船が暗礁などに乗り上げること]; 上架、船を陸上に引き揚げること [船底検査、修繕のため]; [電]接地、アース; 基礎、土台;　基礎工事 [対語]離礁. ／hard and fast: adj. [海][船が]座礁・坐礁(ざしょう)して動かない; [規則などが]厳重な(strict). ・　to pile up: vt.,vi.[船を]坐礁させる、[船が]坐礁する、擱座する. ／to be driven(or washed) ashore: 岸に打ち上げられる. ／to run a ship aground: 船を座礁させる. ／to run ashore: 乗り上げる、坐礁(座礁)する、浅瀬に乗り揚げる(＝to be driven ashore). ／to run on: [船が]…に乗り上げる→ to run on to the ground岸に乗り上げる、座礁する. ／to strike: vi. [船が]座礁する; ぶつかる、衝突する(＝collide)[against, on, upon　…]→ The ship struck on a rock. : その船は座礁した. ／omnivore: n.雑食者　[英語]Organisms that eat anything, both plant and animal. ／humpback: n.[動]ザトウクジラ(humpback whale) [学名]Megaptera novaeanglidae[こぶのような背鰭がある]; [魚]カラフトマス、セッパリマス(humpback salmon) [学名]Oncorhynchus gorbuscha. [参考]humpback: 猫背[の人]、せむし[の人]の意味がある; ザトウクジラの最も一般的用語は humpback whale. ／humpback whale: n.[動]ザトウクジラ [学名]Megaptera novaeanglidae. ／boarding officer: 乗船官吏(かんり)[税官吏など]、船内臨検士官(税関吏); 訪問士官 [入港の軍艦を儀礼的に訪問する 士官]. rummage: vt.[海][船内]をくまなく点検する、[税関官吏・税関吏が]船内捜索をする、[船を]検査する、臨検する;　…を隅から隅まで捜(さが)す、かき回して捜す; 船積み荷物の余積を作る、vi. [海]臨検する、捜索する[in];　かき回して捜す、 くまなく捜す[about, for, among, in …]. ・　to rummage a ship for　…:　…を捜して船内をくまなく調べる. ・　to rummage a ship for opium:　阿片(あへん)を捜して船内をくまなく調べる. zenbei-nettai-magurorui-iinkai全米熱帯マグロ類委員会: Inter-American Tropical Tuna Commission [略: IATTC]. ／fore: adj.前部(前方、前面)の(opp. hind, back)、adv. [海]船首に(の方へ)、n.前部、前面; [海]船首部; [海]前檣(しょう) (foremast). ・　at the fore: [海]前檣[頭]に. ／forward: adj. [船などの]前方の、前部の、前部に位置する、船首[部]の、adv.船首の方へ(fore, toward the bow)、 [船・飛行機などの]前部に; [場所・位置など]前方へ(に)、前へ(に);　先へ、外へ. ／forward of the beam: 正横より前方[90oより小さく、270oより大きい関係方位][対語: abaft the beam]. ／forward perpendicular, fore perpendicular: 船首垂線. zenbu-suisen[海]前部垂線(すいせん)、船首垂線: fore perpendicular [略: FP]. zen-chikyuu-no全地球の; 地球的規模の; 世界[規模]の(worldwide): global, planetwide. ／a global disarmament conference: 世界軍縮会議. zenchou[海][船体の]全長: length over all [略: L.O.A.][船首の最前端から船尾の最後端までの水平距離]. ／from stem to stern; [ボートの]ram; overall, total(full) length: [船の]全長. zenchou-ido-kouhou漸長(ぜんちょう)緯度航法、漸長緯度航海算法(さんぽう): Mercator's sailing, Mercator sailing [漸長緯度を用いながら航程線の各要素を求める算出法]. zenigata-azarashi[動]ゼニガタアザラシ(ワモンアザラシ): ringed(spotted) seal, Pusa hispida Schreber [参考]食肉目・アザラシ科。北海道から千島列島、カムチャッカ半島にかけて生息。体表に"銭形"の斑紋がある. zenki-shigyo前期仔魚(ぜんきしぎょ): prelarval form [of fish]; sac fry. ／All Japan Purse Seine Fisheries Association: n.全国まき網漁業協会. ／National Association of Marine Fish Culture: n.全国鹹水(かんすい)養魚協会[日本]. ／National Association of Saury Fishery: n.全国さんま漁業協会[日本]. ／National Federation of Inland Water Fisheries Cooperatives: n.全国内水面漁業協同組合連合会[日本]. ／National Federation of Kneaded Fisheries Products Cooperatives: n.全国蒲鉾水産加工業協同組合連合会[略称: 全蒲連][日本]. ／National Federation of Nori and Clams Fisheries Cooperatives: n.全国海苔貝類漁業協同組合連合会[日本]. ／National Federation of Pearl Cultivator's Cooperatives: n.全国真珠漁業協同組合連合会[日本]. ／National Federation of Processed Fisheries Products Cooperatives: n.全国水産加工業協同組合連合会[全水加工連][日本]. ／National Federation of Salmon Drift-net Fishery Cooperatives: n.全国鮭鱒流網漁業組合連合会[日本]. ／National Fisheries Cooperatives Mutual Relief Association: n.全国水産業協同組合共済会[日本]. ／National Larger Size Squid Angling　Fisheries　Association: n.全国大型いか釣漁業協会[日本]. ／National Promotion Council of Carp Culture: n.全国養鰻振興協議会[日本]. ／National Rainbow Trout Promotion Society: n.全国虹鱒振興会[日本]. ／National Salmon Drift-net Fisheries Cooperatives: n.全国鮭鱒流網漁業協同組合[日本]. ／National Squid Angling Association: n.全国イカ釣漁業協会[JASFA][日本]. ／National Research Institute of Aquaculture: n.養殖研究所[日本]. ／National Research Institute of Fishing Engineering: n.水産工学研究所[日本]. zenkuha[海]前駆波(ぜんくは): forerunner of swell [参考] forerunner: n.前触れ、先触れ; 徴候、前兆; 先駆者. ／a total ban on the taking of gray and right whales: コククジラ(gray whale, grey whale)・セミクジラ捕獲全面禁止. zen-nihon-kaiin-kumiai全日本海員組合: All Japan Seamen's Union. zen-nihon-kouwan-roudou-kumiai全日本港湾労働組合: All Japan Dock Workers Union. ／front: n.[気]前線 [性質が異なる２つの気団の境界面(すなわち前線面)と地表面との交線;　前線の両側にある気団の 運動に基づいて、温暖前線・寒冷前線・停滞前線・閉塞前線に区分される;　またその地理的位置に基づいて極前線・寒帯前線・ 赤道前線に分けられる]. ／frontal thunderstorm: n.[気]前線雷、界雷 [前線に沿って発生する雷の総称;　特に寒冷前線に沿って多く発生する]. ／frontal zone: n.[気]前線面 [性質が異なる２つの気団の境界面のこと;　この前線面と地表面との交線を前線(front)という]. zenshin前進[例えば、船が前方に航走すること]: ahead, foreway, go-ahead, headway [対語]後進. ／Go ahead! : [海][号令]前進!(opp. Go astern! 後進)、掛れ！、[俗語]ゴーヘイ！; [俗語]やれ！、そらやれ(行け)！. [参考]前進(go ahead) のいろいろ:　full ahead 前進全速、half ahead 前進半速、slow ahead 前進微速、dead slow ahead 前進極微速 [対語]Go astern:　[号令]後進. ／to go ahead: 前進する;　続ける; [命令法]ゴーヘー！、前進！ [対語]to go astern. ・　to forge ahead: [船が]漸進(ぜんしん)する、前進する、次第に追い迫って行く、後に引き離す. ・　to gather way: [船が]動き出す、前進力が付き始める、前進し出す、行き脚(足)をつける. ／headway: n[船の]前進; 進航(進行)速度、船の速力、船足(ふなあし)、船脚、前進の行き足; [船・列車などの]運航 (運転)間隔; [仕事などが]はかどること、進捗[度]. [英語] headway: the forward movement of a boat through the water. ・　to fetch headway: [船が]前進力を得る. ／to heave a ship ahead(or astern): [綱を巻いて]船を前進(後進)させる、[対岸・僚船などからの綱・索を手繰って]自船を 前に(後ろに)進める. ／to keep [her] way: 機関の停止後前進する、帆を降ろした後(畳んだ後)前進する. [画像参照: 機関室へのエンジン停止、前進・後進の速度の指示器(stop, dead slow, slow, half, fullなど)]. ／bathypelagic: adj. [生態]漸深海の; 中深海浮遊性の [漂泳区の区分の１つ; 水深1,000～3,000(4,000)mの海水層]. ／bathyal zone:　大陸傾斜帯;　[生態]漸深海底[帯][底生区の区分の１つ; 水深200～2,000メートルの海底 oceanic depth zone extending from 200 to 2,000 meters below the ocean surface] [参考] oceanic depth zone: 大洋の深海帯. zenshin-zensoku前進全速: full speed ahead／crash back, crash astern: 全力後進／前進強速. ／fore: adj. [海]前檣(ぜんしょう)の; 船首の、[船の]前部の; 前部(前方、前面)の(opp. hind, back). ・　at the fore: [海]前檣に、前檣頭に; 前方に. ／foremast, fore mast: n.[海]前檣(ぜんしょう)、前マスト、最前部マスト、フォアマスト [西語: palo de proa, palo trinquete];　前檣の下檣. ・　foremast seaman: 前檣員[帆船における前檣(フォアマスト)の作業員]、平水夫(＝foremast man, foremast hand). ／foremast man(pl. -men), foremast hand: n.[海]前檣員; 水夫、平水夫(man before the mast); [昔の]水兵、水夫. ／foremastman(pl. -men), foremasthand: n.[海]前檣員; 水夫、平水夫(man before the mast); [昔の]水兵、水夫. [英語]forestay: [英語]the foremost stay, running from the masthead to the stemhead, to which the headsail is hanked. ／head lamp, head light: n.前照灯(→　headlight). zenshuutou全周灯: [英国] all-round light, [米国] all-around light. ／at full(or half) speed: 全(or半)速力で→　dead slow speed: 極微速. ／at full steam: [例えば、船・汽船などが]全速力で(＝full steam ahead); 蒸気力を全部出し[切っ]て. ／amain: adv. [古語]力一杯に; 全速力で(at full speed)[Suddenly: forcibly. To let go amain, to let go suddenly]. ／full ahead: 前進全速→ full astern: 後進全速／slow speed ahead(or astern): 微速前進(or後進). ／full astern: 後進全速→ full ahead: 前進全速. ／to race: vi.競走する、競争する、競漕する; [プロペラ・推進器などが]空転する、急転する、vt.…を全速力で走らせる、 疾走させる. ／A.T.L. : "actual total loss"の略。「絶対全損」の意で、船舶が当初付保された時の状態を認知できないほどに破壊 されるなどして全損を被る場合、あるいは付保された物件が原状回復不可能になった場合をいう. ／full-rigged: adj. [海][帆船が]全装の、全装帆の、全装備された; 完全装備の→ a full-rigged ship: 全装船. ／flush deck: n.[海]平甲板(ひらこうはん) [船首から船尾まで平坦な甲板]、全通甲板[船首から船尾まで途切れることなく繋がって いる甲板]. ・　flush deck vessel: n.[船]平甲板船 [船首から船尾まで平坦な甲板が通っている、船楼をもたない船](＝flush decker). ／flush decker: n.[海]平甲板船 [船首から船尾まで平坦な上甲板をもつ船;　俗に通しデッキの船と呼ばれる]. zentsuurou-sen[船]全通楼船(ぜんつうろうせん)、全通船楼船(ぜんつうせんろうせん): complete superstructure vessel; complete structure vessel [船楼が船首から船尾までつながっている船]. [文例]Human technology can now fish whole species to virtual extinction. : 人間の技術はすべての魚族を事実上絶滅に至る まで漁獲可能とする. ／fishkill: [水質汚濁による]魚の大量死 [参考] piscicide: [ある水域の]魚類の絶滅; 殺魚剤→ (adj.) piscicidal. zetto-yoriＺ撚り(ぜっとより)、左撚(よ)り: Z-twist [英米の右撚り、right-handed twistに相当するもの; 撚り方が Ｚ字の縦軸と同じ向きになったロープで、現在の船ではこれが多用される]. proceed: v.発航する; 進航する; 続航する; 続ける. ／to proceed under way: 航行を継続する. ／to proceed with　…:　…を続ける;　…で航続する. ／a generic name(term): 属名(ぞくめい)(→ genus [生][生物分類の]属(ぞく)[familyとspeciesとの間]). ／genus: n.(pl. genera or genuses)[生][生物分類の]属(ぞく) [科(family)と種(species)との間に位する](→ generic name, taxonomy); [一般的に]種類(kind, sort, class). ／race: n.人種; [動]種類、属、種族; (the ～)人類、人間(mankind). ／northern elephant seal: [動]キタゾウアザラシ [食肉目・アザラシ科]. ／sea elephant: n.[動]ゾウアザラシ(elephant seal)、セイウチ、海象(elephant seal). ／southern elephant seal: [動]ミナミゾウアザラシ [食肉目・アザラシ科。ミナミハナナガアザラシともいう]. zouha-teikou造波抵抗: wave-making resistance [船が航走することによって波が引き起こされ、その波によって 船体に生じる船体への抵抗]. ／ship money: n.[英国史・法]建艦税、造艦税 [主に海軍の強化、戦時における軍艦建造費の財源として海港及び 海岸都市に課した税]、船舶税 [1634年、Charles I世が内地都市にも課したことで、Great Rebelion(English Civil War)の 原因となった(1640年に廃止された)]. ／to swab: vt.(swabbed, swabbing)…に雑巾がけをする: . ／to swab [down] the decks: 甲板を雑巾ぼうきで拭く. zousei[漁場の]造成: → [文例]An industrial zone has been reclaimed from the sea. : 海が埋立てられて工業地帯が 造成されてきた. ／building dock: n.造船船渠(せんきょ)、造船ドック、建造ドック [船体が完成するまではドック(渠内・きょない)に置き留め、その完成後は 漲水(ちょうすい)して(水をはって)浮かせて曳き出す]. ／constructor, -er: n.建設者、建造者;　[海軍]造船技師、造船官; 建設者(業者). ／marine architect, naval architect; marine(naval) engineer: 造船技師 [参考]architect: n.建築家、建築技師. ／shipbuilder: n.造船者、造船家; 造船技師; 造船業者; 造船会社;　造船所. ／shipbuilding: n.造船、造船業、造船事業; 造船術、造船学(→　boatbuilding)(cf. naval architecture). ・　shipbuilding yard: n.造船所(shipyard, dockyard). ／a shipway; a slip[way]: 造船台; 船架(せんか)、引き上げ船台[傾斜した造船台]. ／a shipyard, shipbuilding yard; a dockyard: n.造船所(cf. boatyard). ・　off the stocks: 進水して、完成して. ・　on the stocks: [船が]建造中の. v.(-pp-)vi.滑る、vt. [海][錨・錨索・錨鎖(びょうさ)を]放つ、放す、出し放しにする、はずす; [錨を]入れる; [結び目など] をほどく(untie); [足などを]滑らせる; 放つ、放す、出す. ／shipway: n.[船を建造する時の]造船台、[造船所の]船台; [造船][乾ドックで修理する時の]船台; 大船運河(ship canal). ／slipway: n.[海・造船]船架(せんか)、[造船台の]斜路、[傾斜した]造船台、引き上げ船台(せんだい); スリップウェイ [捕鯨母船や船尾式トロール船の船尾に設けられた斜溝甲板(ramp)]、船尾斜溝甲板(skid way)(→ 船台); 船揚場. ／propagate: vt.[動植物・菌など]を繁殖(増殖)させる、ふやす; [思想などを]普及・流布させる; [音響・電波などを] 伝搬する; [性質など]遺伝させる、vi.繁殖(増殖)する; 普及する、広まる; 伝搬する. ／propagation: n.[動植物などの]繁殖(→　breeding)、増殖; 普及、伝播; 伝搬;　まん延. ／reef-building: → reef-building coral species: n.pl.造礁サンゴ種. chart: n.海図(nautical chart, marine map)、水路図; 図、図表、地図; [特殊な状況・事実などを示す]略図、 図表、vt.…を海図(図表)に作る、海図化する、海図に記す、図誌する. ／General Bathymetric Chart of the Oceans: 大洋水深総図 [略称: GEBCO][｢ゲブコ｣または｢ジェブコ｣として親しまれてきた 国際水路機関の刊行物。第５版は縮尺１千万分の１、全18図(全世界を18図幅に分けて編集)からなる海の科学的総図で、 1975-82年に完成した。なお、第5版は1994年｢GEBCOデジタルアトラス｣として英国海洋データセンターからCD-ROMとして出版され、 1997年には改訂版が出版された]. ／general chart of coast: 沿岸総図. ／great circle chart : 大圏図. ・　a skull and crossbones: n.(pl. ～s and ～s)どくろ [もと海賊の旗印]; 海賊の旗・旗印[など][大腿(だいたい)骨を十字に 組み(交差させ)、その上にしゃれこうべ(頭蓋骨)を配置した図形; 死の象徴; 海賊の旗印]. zuihansen[船]随伴船: tender boat [大型船に付き添い、食糧補給や旅客の上陸などに使われる船] [参照]付属船. ／hooded seal, Cystophora cristata Nilsson: n.[動]ズキンアザラシ、ハナブクロアザラシ[哺乳綱食肉目アザラシ科 ズキンアザラシ属]. ／canvas: n.[集合的]帆; 帆布、ズック [麻、綿などの厚手の布地で、帆やテントなどに用いる]; 画布、カンバス、キャンバス. ／duck canvas: n.[俗称]ズック(→ cotton canvas). ／sailcloth, sail cloth: n.帆布(canvas)、ズック; 帆木綿. [文例]Shifting nealy an acre of sailcloth was strenuous work, even when not under fire. 面積がほぼ１エーカーもある帆の方向 (位置)を変えるのは、砲火にない時でさえ骨の折れる仕事である. 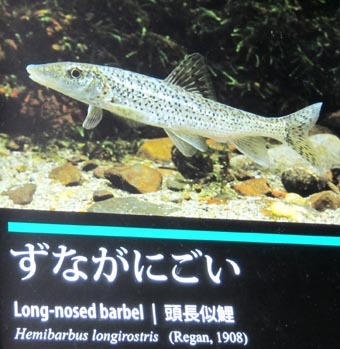 zunaganigoi[魚]ズナガニゴイ: long-nosed barbel, Hemibarbus longirostris (Regan, 1908)　[画像(z22119.jpg)／京都水族館2012.10.15]. ／North Pacific Ocean queen crab fishery: n.北太平洋ズワイガニ漁業.